Five Belmont students were honored for their public relations campaigns at the 2018 Public Relations Society of America Nashville Chapter’s Parthenon Awards April 30 at the Country Music Hall of Fame. Receiving an Award of Merit for their “Instruments of Joy: Strike a Chord Campaign,” Haley Becker, Makenzie Clayburg, Thomas Koerschen and Alora Lauver held a campaign in fall 2017 for their public relations campaigns class. The initiative included fundraising events for Instruments of Joy, a nonprofit organization dedicated to providing quality musical instruments to aspiring musicians in developing countries. Callie Edwards received an Award of Merit for her “Dickens Dynamics” awareness campaign in spring 2017 on behalf of the T. J. Martell Foundation, a nonprofit organization partnered with the music industry to raise funds for innovative medical research to cure leukemia, cancer and AIDS. Area public relations/communications professionals and students attended the annual awards ceremonies. The Public Relations Society of America is the nation’s largest association of public relations and communications professionals. 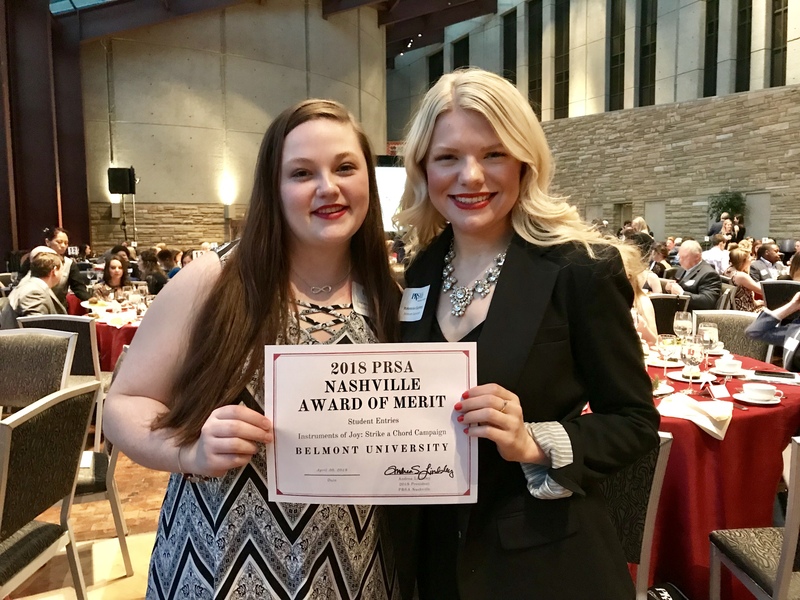 The PRSA Nashville Chapter includes almost 200 members and sponsors five student chapters of the Public Relations Student Society of America, including Belmont PRSSA.